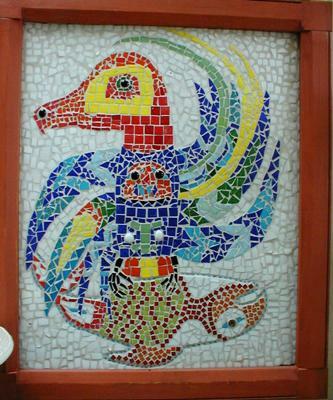 This is a picture of one of the first mosaic I ever created some years ago. My aunt had sent me a card with a picture of a tribal bird on it, I thought how amazing would this be as a mosaic. My uncle added the perfect frame to it for me to give it a more polished look. It now hangs at the Tribal hall in Coos Bay Oregon.